To motivate my own boring & lonely exercise cycling routine, I've imagined a bike ride from my home in Washington state to my cousin's home in Vermont. I started out riding 10 miles every day on my exercise bike, and I've mapped out where that would take me on this journey. At this rate, I'll make it to Vermont in less than a year! And at some point I will feel justified in my self-indulgent physical travel back to visit my cousin & my ancestral home. I wanted to ride across the most direct route possible, so I planned to go between the Great Lakes by crossing at Sault Ste. Marie into Canada and then just drop down into Northern Vermont. (Only a map-gazer would think of this as “dropping down”.) But I was intrigued by the place names across the middle of Canada, where I have never travelled. I thought that region might be more interesting than the famously boring "flyover" lands of Montana & North Dakota. (Shows how little I understood.) So I added a mere 100 miles to my trip for a chance to explore Midwestern Canada. I wanted to see this journey close up. Not panoramic vistas and bird's-eye views. Not anonymous 4-lane US Interstate highways. I wanted to be able to see & distinguish each location along the way, to sense what people who live there experience. So I planned to "travel" on older US highway routes, not Interstates. I did not realize that the Trans-Canadian Highway was just such an anonymous superhighway. But when I do have a stopover, I search for the smaller human-scale scenes that make each place distinctive and interesting. I want to explore these places not as a tourist, but trying to understand & respect the land and the people in that specific location. I've collected photos from other people's internet postings to find out what I might see along the roadside on my way. I’ve myself a wall map along my hallway of Google map segments taped together, surrounded by little “picture postcards” of each stopover scene. Is it really “travel” if you stay safe & warm at home? No, of course not. But it is a personal journey that has taken my mind out of my cozy comfort zone of familiarity. In searching for distinctive images of specific locations, I’ve also discovered other virtual travelers. Andrew Dunn of Vancouver, British Columbia, bikes 7 km to & from work, but wanted to turn that commute into a virtual ride across Canada to St. Johns, Newfoundland. That’s 8,000 km (4,970 miles) – way farther than my own transcontinental ambitions! And Andrew needs to deal with the real-life weather & traffic of Vancouver in all seasons. All of Andrew’s images are from Google Street Views, so they show literally what you could see from the road. 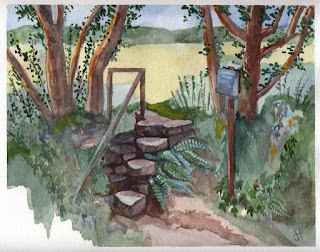 November 19, 2013 "stone stair near Constantine"
Jane Tims, a botanist and writer living in New Brunswick, rides her stationary bike for a set amount of time each session, then views her planned ride on Google Street View. She has (virtually) toured around central France, Cornwall, and her own New Brunswick. She discovers beautiful scenes along the way, focusing on a sense of place and the former lives of abandoned buildings. 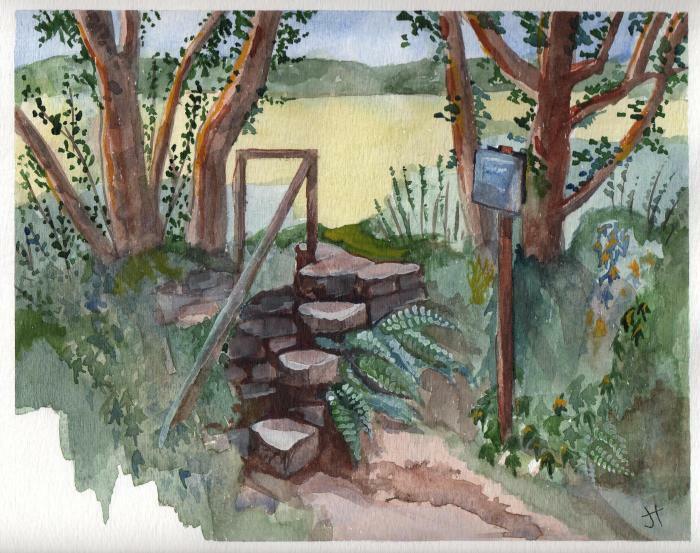 After her biking, she paints her favorite scenes in watercolor. She also writes poetry about her thoughts and feelings inspired by the experience. And she chronicles her experiences on her blog. Admirable! Frank Garcia completed a virtual bike ride to the summit of Mt. 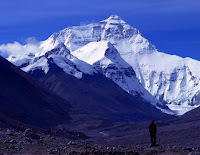 Everest! He used a stationary bike that had been programmed to recreate similar slopes and distances he would encounter had he been on the mountain – minus the incredibly low levels of oxygen, of course. The ride was then verified by an organization called Hells 500, which has created a new activity called "Everesting." Crazy extreme! 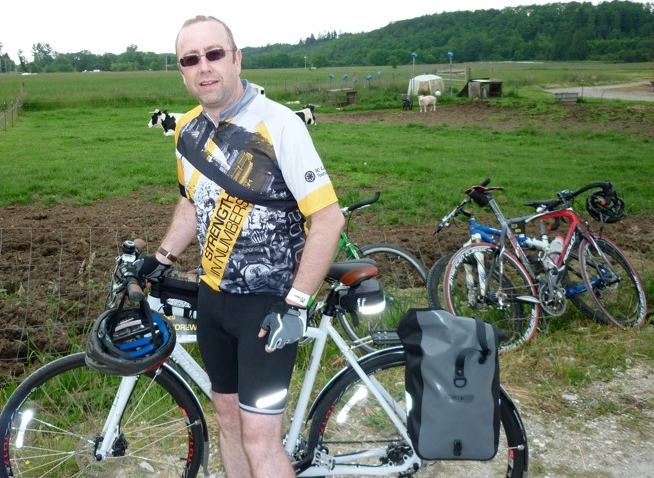 Mark Zipf actually rode across Canada, from Vancouver to Toronto, and blogged about his adventures on the road. That’s the kind of serendipitous experience that we virtual travelers miss, for better or worse. Mark’s blog lets us all in on it, vicariously. He also reflects: “We live in an age where the automobile, train or plane has made the experience of traveling a series of pictures seen through a pane of glass. By pedaling from Vancouver to Toronto I hope to meet some of the people and live the experiences that make this country special.” Of course, we virtual travelers are very much experiencing “a series of pictures seen through a pane of glass”. I also discovered that charities who raise funds by organizing bike rides will accept “virtual” bike rides on a stationary bike, as long as you send them the donations they seek through this event. 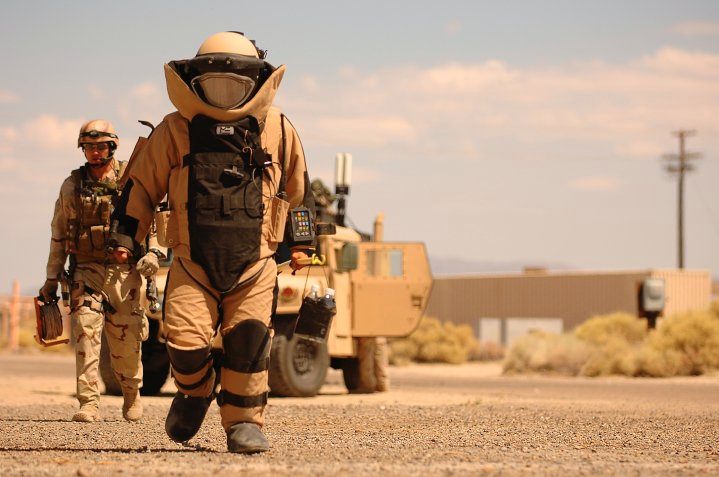 My particular favorite is the EOD Warrior Foundation which helps bomb disarmers (Explosive Ordnance Device specialists) who have lost their limbs or their lives doing this dangerous work.